The Fiery Creek Prospect consists of the historic Fiery Creek and Macanally gold and copper working from the early 1900’s that extend for over 7km. Historical mining at the Fiery Creek & Macanally Prospects was reportedly only mined down to a level of approximately 40 foot (or 12 metres) below surface. This is thought to coincide with the depth of oxidation, thus leaving behind the sulphide dominant ore below. The sulphide dominant ore would have been much harder to treat during the time of mining in the 1890’s as the processing would have been substantially more complex. 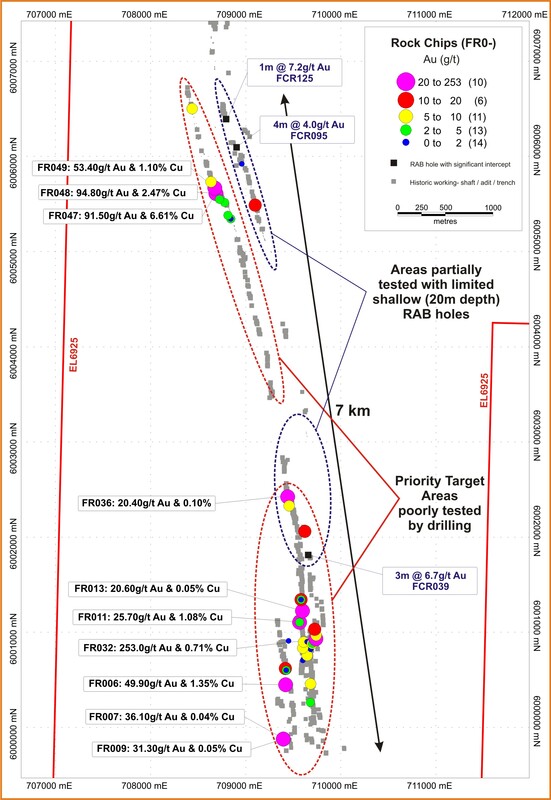 Ironbark considers there is a high potential to locate economic grade mineralisation in the area as to date there has been limited drill testing of the lodes below the historically mined material. The extent of the historical workings indicates a good probability that sufficient tonnes to be of interest could be located in the area. 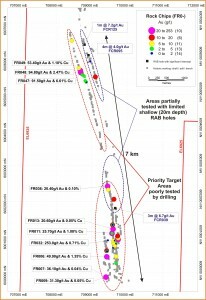 Systematic drill testing underneath the workings, especially around the recent higher grade rock chip samples, has not been completed and presents an exciting exploration opportunity.